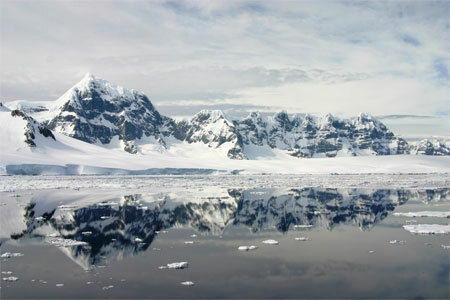 The Lemaire Channel near the Antarctic Peninsula. This was an epic day: scenery, history, and whales. The sun had been up for hours by the time we turned out on deck to marvel at famous Lemaire Channel. The Akademik Ioffe plowed easily through bergy bits and pancake ice between vertical blue-black peaks and their millions of tons of glacier ice, both close on either side. 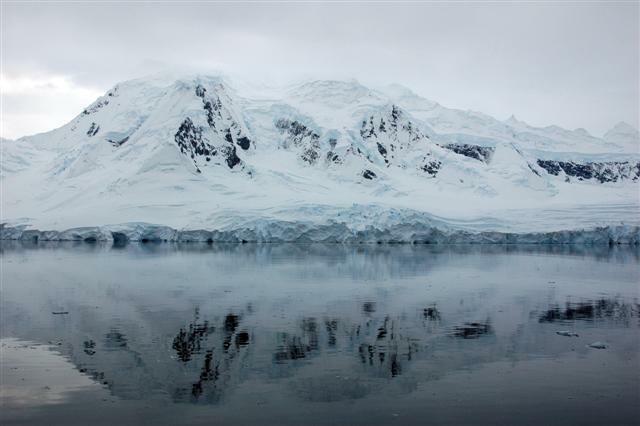 The narrows of Lemaire are only five miles long and a mile wide, and might be the most-photographed spot on the Antarctic Peninsula. We certainly snapped many a photo, and occasionally reminded each other to put the cameras down and just absorb the majesty we had come so far to witness. Just before the end of the channel, where it opens wide to the Pacific Ocean, the ship stopped and pivoted in place using bow and stern thrusters to return northward. We had an appointment after breakfast at historic British Base A, now known as Port Lockroy. There a small museum is kept up by a summer interpretive staff and by our contributions to “the best gift shop in Antarctica.” One can warm up with the lovely Antarctic Tartan (made in Scotland), sample an assortment of excellent books and souvenirs, and send postcards that will follow you home. There are two landing spots here and staff kept up a shuttle schedule to swap passengers between them halfway through, as only 50 are permitted ashore at either place at a time. Jougla Point is an extension of Weincke Island that juts out from under the glacier a stone’s throw across the water to the base on miniscule Goudier Island. Like any exposed land, the point is covered with nesting birds, including hearty colonies of Gentoo Penguins, Kelp Gulls, and a few unusually accessible Imperial Shag nests. A couple of Weddell seals were hauled out for a nap. In the sheltered waters behind the point, the handsome sailing yacht Australis was anchored for a visit. Cheesemans’ staff member Michael Moore was stationed at a blue/fin whale skeleton assembled by the Cousteau team fifty years ago. There are piles of whale bones and bits of wooden casks dating from between 1911 and 1931 when whaling factory ships were moored here to process whales caught in the wider channels. One huge skull has been propped vertically, its tapered rostrum pointing into the heavens, as if rising up to gulp a mass of krill in the clouds. After the whalers left their massive mooring chains and cables to rust into the rock at the Goudier Island landing, the British set up Base A in 1944 to keep an eye on German activities. They found few Germans but lots of weather, and the base operated until 1962 studying the atmosphere. The based is restored to show how a few ruggedly self-sufficient men lived in very close quarters with each other, depending only on themselves and each other during long winters. The main building is sheathed in black tar paper with red wood trim. It’s quite striking, perched on top of this truly tiny rock of an island, made more picturesque still by the Union Jack on a flagpole and by the remarkably tolerant red-billed Gentoo Penguins nesting right up next to and even under the frame of the building. The short path to the buildings from the stone shelf that serves as a boat landing passes so close by the penguins that even humans must be wary of a penguin lifting its tail, lest a five-foot squirt of processed krill land a little too near. Penguins don’t seem to mind this; they routinely get soiled during their nesting watches and ritually wash themselves once back in the sea. We took a feather from the penguins’ book and rinsed our boots and pant legs at the landing before getting back in the Zodiacs, to avoid bringing back a bit too much of the Southern Ocean essence into our cabins. Beautifully hand-crafted antique dog sledges are racked outside the hut, and at the door, propped open by a large whaling harpoon head, are wooden skis, rawhide snowshoes, and various accouterments of polar life. The museum’s centerpiece is a small room containing “The Beast,” an imposing bank of electronic equipment that supported intensive study of the ionosphere. This dates from an age when anything one discovered was new to science. The bunk room, dining room, kitchen, and recently-restored workshop all captivated our attention. Handmade paintings of Hollywood movie stars have been discovered under layers of paint. On the shelves are books and magazines that some of our own British-born staff and participants recognized from their childhoods. The little toilet and bathing room is draped with long woolen underwear on a clothesline. There is even a darkroom. Checkered tablecloths and sheets on the beds made it seem that everything was ready for the invisible men who lived here to return, once the throng of Gore-Tex-clad tourists vanished for the day. In a modern-day twist of Antarctic survival, we learned that the when the Port Lockroy staff come aboard our ship to give us a briefing before landing, they bring a couple of five-gallon water jugs to fill. Despite the sea water and glaciers all around, drinking water is hard to come by where meltwater streams are nearly nonexistent. The staff also take turns showering aboard the various ships that visit. This type of reciprocity brings a warm, homey feel to visiting an Antarctic outpost. After our landing the Ioffe stayed in place and we invited all the Port Lockroy staff to join us for a hamburger barbecue on the back deck. It was fun and funny to sit at plastic deck chairs and tables, dredged up from some storage hold, watching the sunlight play on ice faces all around as penguins porpoised across the water below us. A dance party evolved after dessert. Silly penguin and reindeer hats came out of hiding and a certain geology lecturer sported a traditional Arab head-scarf, courtesy of our esteemed voyage participant from Saudi Arabia. Some of this headwear was still in evidence when everyone on board gathered for our official group portraits up on the top deck. When we pulled anchor, the day was only just getting started. 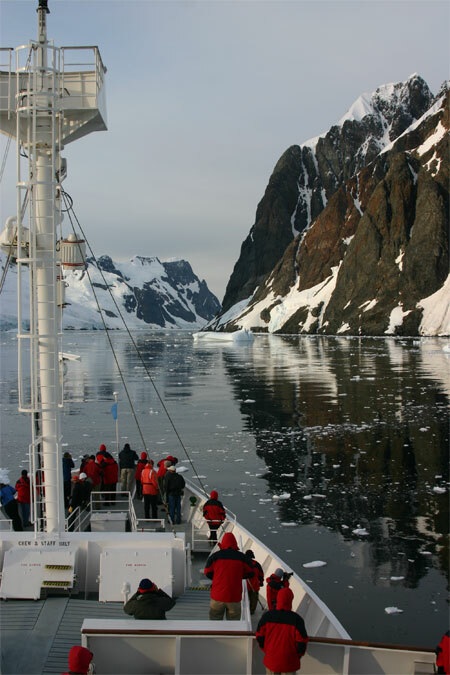 During the afternoon our ship cruised through Ted Cheeseman’s favorite passage in Antarctica, the winding Neumayer Channel, then across the Gerlache Strait to a favorite landing of manyAntarctic Peninsula visitors: Neko Harbour in Andvord Bay on the mainland Peninsula. Glassy waters reflected glaciers all around. Clouds covered our heads but looking back out of the bay we enjoyed seeing the low evening sun exquisitely lighting up the massive 10,000-foot mountains in the distance across the Gerlache Strait. The Neumayer Channel is 16 miles long, separating Anvers Island from Wiencke Island and Doumer Island. This channel was originally named the Roosen Channel by a German expedition in the 1870s. It was later named for Georg von Neumayer by the Belgian Antarctic Expedition, 1897-99. 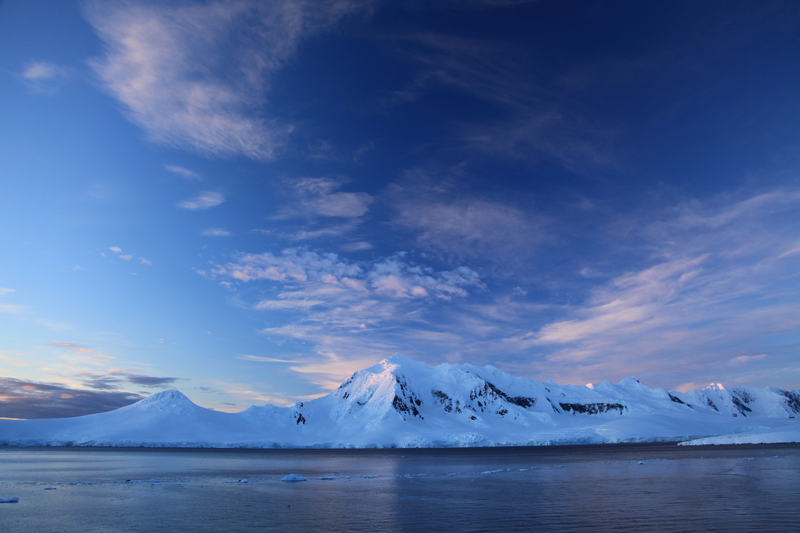 The Gerlache Strait between Anvers Island and the Antarctic Peninsula. Tsunamis from glacier calving wash ice far up the landing beach at Neko so we were warned not to sit on the slope facing the glacier. The Gentoo Penguins seem to know how high is high enough, nesting as usual on rocks above the beach. Those who wanted more altitude climbed up a snowy path across glacier ice to an outcrop with lovely views and some deeply-worn sliding paths down a very steep run. I was driving a Zodiac this year but last year I enjoyed the slide, amazed that the snow walls were over my head like in a bobsled chute. Neko Harbour is named after a whaling ship, but this is one place the whales have taken over again. 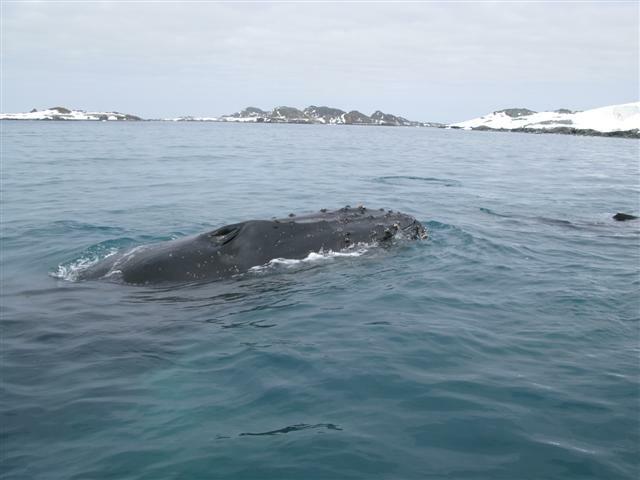 As is often the case in this bay, we had wonderful encounters with feeding humpback whales. A single whale worked near the landing and another pair were feeding among bergy bits on the other side of the bay. Several boats had incredibly close encounters as the whales surfaced near them, rumbling and blowing raspberries with their huge blowholes. 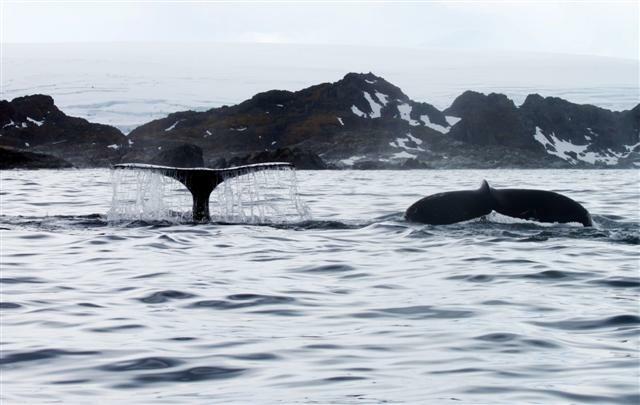 By their circuitous paths and rapid dive pattern we presume they were feeding on krill not far beneath the ice chunks, which they always seemed to avoid bumping. One sleepy leopard seal on an ice floe observed it all with one eye closed. As Zodiacs were returning to the ship, two more humpbacks approached from somewhere else in the bay and passed very close by the ship, to the great delight of all the returning landers who hadn’t yet seen them. It was a sublimely beautiful, calm evening, with the sunset-lit mountain wall in the distance, whales whooshing along the near glacier face, and tiny Wilson’s Storm-petrels dancing across the glassy dark water between blue-white pieces of ice. To cap off a fabulous day, João the bartender offered fresh brownies and a steaming urn of hot chocolate at the top of the gangway. 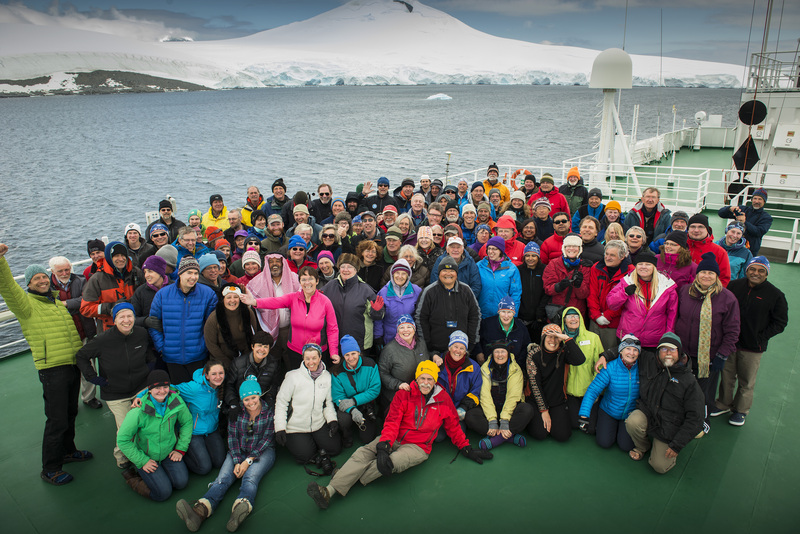 Zodiac cruisers had even been treated to hot chocolate at sea, delivered, with or without spike, by Ted Cheeseman and Doctor Lynne in the roving “bar boat.” It was hard to believe there was only one more day of landings in our fantastic Antarctic adventure.